AMOE, or Alternate Method of Entry will begin on February 7, 2018. The game pieces can be purchased in participating Albertsons®, Safeway®, Pavilions®, Carrs®, Vons®, Randalls®, Eagle®, Pak ‘n Save®, Tom Thumb®, ACME Markets®, Jewel-Osco®, Shaw’s Supermarkets®, Star Markets®, United Supermarkets®, Market Street®, Amigos®, United Express®, Albertsons Market®, Lucky® (Southern California only) and Super Saver® stores (“Market Stores”) nationwide. 1. No Need to Purchase tickets: All you have to do to be qualified for this Promotion, while game ticket supplies last, is making a purchase. This excludes lottery tickets, stamps, tobacco or alcohol products, or other products excluded by law, at any of the participating stores. A participant will receive bonus game tickets every time he/she purchases at any of the stores mentioned earlier. However, they have to be in-store purchases as online purchases will not qualify for a game ticket or bonus game tickets. The number of tickets received will be specified in your receipt. Game tickets will only be given during the transaction and customers will only be allowed one transaction every 3 hours. You will receive one Bonus game ticket with a purchase of participating products and will receive one more with the purchase of ten(10) participating products in one shopping visit. 2. Alternative entry method: You will receive one (1) Game Ticket and one (1) Bonus Game Ticket by sending a self-addressed, stamped envelope to MONOPOLY MON-09 Collect and Win Game Ticket Request, Attn: Promotions Coordinator, P.O. Box 965068, Marietta, GA 30066. Mail-in requests, including both outer envelope and SASE, must be handwritten and must be received no later than May 8, 2018. While ticket supplies last. Limit one request per envelope. Each request must be sent in a separate stamped envelopes with the information including the requestor’s first and last name, street address, city, state, and zip or postal code (name and address must match the return name and address on SASE) legibly handwritten in the upper left-hand corner of the outer envelope. 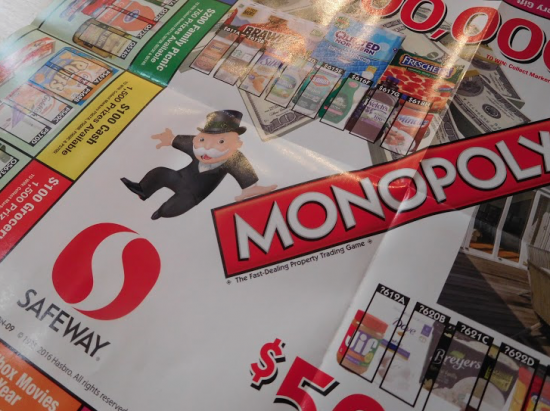 A separate MONOPOLY Collect and Win Employee Game will be held for Employees only. 5. ENDING OF PROMOTION: The scheduled end date for the game materials will be on May 8, 2018. This Promotion ends on May 8, 2018. Unclaimed Prizes will not be awarded. However, there are second change prize drawings for the two $1 million grand prizes if they are unclaimed.